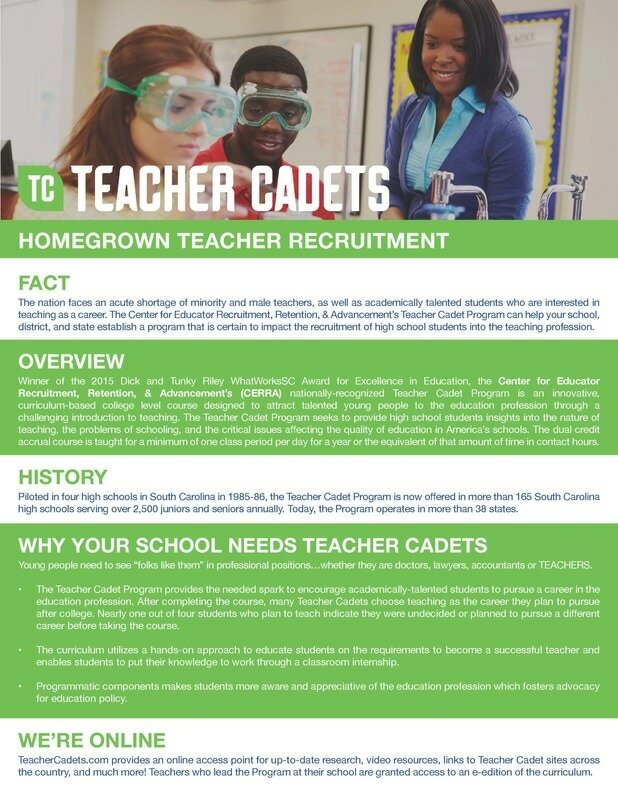 ​Teaching is a respected, influential profession, and every student in South Carolina is served by effective educators. ​CERRA is the oldest and most established teacher recruitment program in the country. The Center for Educator Recruitment, Retention, & Advancement was established by the Commission on Higher Education in December 1985 and is funded by the South Carolina General Assembly. Following the passage of the state's landmark Education Improvement Act, CERRA was created out of a concern for the condition of South Carolina's teacher supply pool and a need for a centralized teacher recruitment effort. CERRA's agenda is a comprehensive one in which the Center pursues a variety of programs for increasing the number of students in the education pipeline and recruiting and retaining qualified, caring, and competent teachers. The Center's primary target groups are middle and high school students, college students, and adults interested in changing careers. CERRA also targets groups of accomplished teachers through programs including mentoring, teacher leadership and National Board Certification. 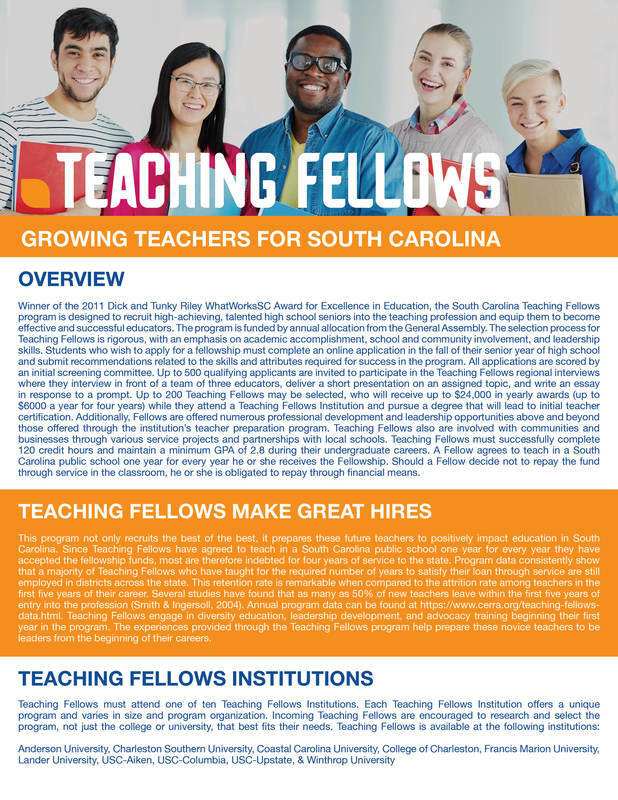 The network of educators in our programs overlaps in powerful ways to increase the level of collaboration for recruitment, retention, and advancement of South Carolina educators. Each year CERRA releases an Annual Report that provides a summary of the state of our programs and services. You can download our most recent Annual Report below. ​The Center for Educator Recruitment, Retention, & Advancement offers an array of programs and services that carry students and prospective teachers from middle school through classroom professional development. CERRA segments its program offerings into three areas: pre-collegiate, pre-service, and service. Many of our programs serve as a national model for teacher recruitment and teacher leadership initiatives. CERRA offers an array of services and programs that impact the recruitment, retention, and advancement of teachers from middle school through their professional careers. Our services are designed to support our mission and help public schools locate high quality educators to lead classrooms. ​We would love for everyone to spread the word about CERRA's programs and services. To assist with this, we have developed a PowerPoint Presentation that anyone can use. ​If you have any questions about the presentation, contact Todd Scholl.